The Goldfaber brand is definitely marketed in North America – but it’s more known as a student or craft line of pencils. I’m not sure if one can actually buy this specific pencil here – I’ve certainly never seen one in person. The 1222 is a real sleeper in the New Zealand/Australia series. The only branded pencil in the series with an eraser, it is a sleek alternating Royal Blue/Silver combination, with gold and white stamping. It has a silver coloured ferrule with a white eraser. No country of manufacture is indicated. It certainly has a finished appearance. 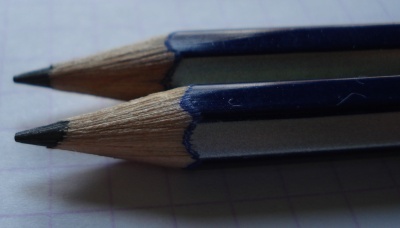 Unlike other pencils in the series, whose colour schemes may be equal or superior as palatte choices, the 1222 is unique in having a high quality varnished finish, absolutely smooth and bright. For what I suspected was a B-line pencil, the lead is good – not nearly as nice as the 110 – but still rich and dark. The eraser, though white, is rough, not a smooth vinyl, and a disappointment. Browsing around various national Faber-Castell sites, it seems the pencil may originate in Indonesia, though it is cedar rather than jelutong. It is a very interesting pencil, and I am glad to have a couple of them. Goldfaber 1222 is also available in Korea. I like to compare Faber-Castell pencils with Staedtler’s. and FC Castell 9000 is similar with Staedtler Mars Lumograph. than Noris, though Goldfaber has aptly good lead. Thank you for the comment. The Bonanza is another pencil I am not familiar with. It is interesting that both Staedtler and Faber-Castell have several national websites, each showing a different range of offerings. The Tradition 110 seems to be made in both Germany and Australia. It would be really interesting to compare the two versions. I’ve recently posted about Faber-Castell Bonanza 1320, and compared it with Staedtler 134. But because there are a few pictures, I hope that you enjoy them. That looks like a thorough review, though all I understand are the photos, the pencil names, and the Yeats poem! I like those boxes of twelve pencils. A lot of pencils are new sold in “blister packs” or as singles, and the box of a dozen is getting tougher to find. About a week ago I saw around 50 – 60 Goldfaber 1221s in a stationery shop near my flat. I didn’t intend to buy any until I saw the mark “W.-Germany” on them. Nowadays it’s not easy to find a faber-castell pencil manufactured in Germany, let alone West Germany. I have got a tin of pencils That belonged to my great-grandfather. The numbers on the pencils range from number 401 to 423. There are 11 of them and a pencil these where made in Germany and a llead pencil made in yugoslava. Is there any chance you can let me know how old they are. By the look of them they where only used a couple of times. My email address is above. What I can say is H and 2H gradients are much more harder than other brands or Castell 9000. B and 2B are very close to Noris B and 2B. I live in Berlin, Germany. I found this site by accident, nice site. Ihave a Faber Castell Goldfaber 1221F, it writes welv ery hard “lead”, but what I wanted to say was that it is stamped “Germany” in the gold stripe, ad that the stamp s hard to see unless you have bright light next to it. So you might want to check those 1221s that you have. Here is why I am here: What can anyone tell me about the Goldfaber line? Is this their cheaper line or the better line? I got mine in a box of mixed pencils at hte flea market. Is there a “General Info” page for Faber Castell, their home page is strictly marketting crap. Thanks!!! Interesting note: There used to be another Goldfaber under the name ‘Goldfaber 6‘. It is a stenographer’s pencil, and it’s serial number is 7457. By the looks of it, it seems to have come from the late 80’s. It was simply called the ‘Faber 6’ back in the 70’s, but to be fair, the name was enclosed by a gold oval imprint. And it seems like the FC 7457 is the forerunner to the 9008; the ‘steno’ version of the 9000. Glad to find these rare gems, although I can only find B pencils. One more thing: the pencil was bright RED! It is quite beautiful to look at.